The English Ideas Project is an on-going personal project to develop better English grammar and materials. It includes free resources and ideas as well as published materials. I spent a week working with the STANAG Testing Team on their Speaking and Writing Rating Scales for the British Embassy in Skopje in February, and then returned in March to help moderate Reading and Listening test items. I delivered a Masterclass in Teaching course for 14 Military Academy teachers at the Central Officer's Club in Minsk. The course was jointly organised by the Military Academy, the Belarus MOD, the Defence Section of the British Embassy and the British Council in Ukraine. The revised British Council Certificate in Vocational English Language Teaching (CiVELT) course was used as the core of the programme, supplemented with McIlwraith Education materials. The course considered all aspects of ESP teaching and the teachers were introduced to new ideas and activities for skills based lessons, and vocabulary and grammar teaching. The event was closed by HM Ambassador to Belarus, Ms Fiona Gibb, and Colonel Susha, Deputy Commandant for International Co-operation at the Military Academy. I spent a week in Novi Sad in Serbia training a group of military English teachers from Serbia, Macedonia and Montenegro on behalf of the British Embassy in Belgrade. Nine teachers spent the week looking at planning different kinds of lessons, considering new ideas for reading skills lessons (the Deep Text and Dual Text approaches), developing listening and video lessons, and thinking about how to create better information gaps. At the end of the week, the participants worked in groups to develop lesson plans and materials based on the ideas explored in the seminar. These will now be polished, trialled and shared. 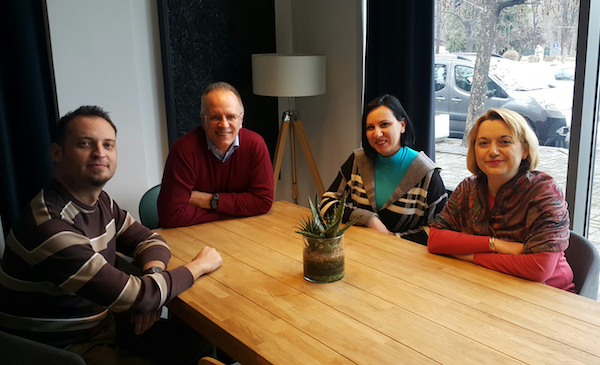 I returned to Skopje to work with the great team at the Centre for Foreign Languages as they started the revision of their English language course curricula. The seminar was organised by the British Embassy in Skopje. The CfFL team looked through the current STANAG descriptors and identified what tasks and topics were not currently included in the curriculum and added these. Then all the course curricula were reviewed and revised in detail, the course length and number of hours were reconsidered, and the placement testing process was revised. The teachers now have to complete the revision process ready for the new curricula to be introduced in January 2020. Skopje is currently enjoying a lovely golden autumn and was beautiful in the warm sunshine. The British Council/LATE Summer School for Teachers of English entitled Coping with Competences was held between the 15th August and 18th August 2018 in Priekuļi, Latvia. 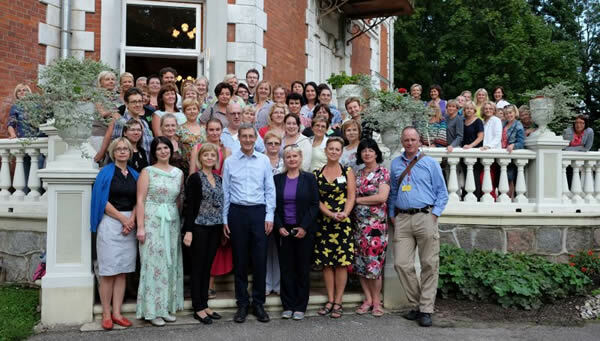 Fifty-four teachers took part in the three day event held at Priekuļi Technical School. The event was funded by the British Council, and organised by the Latvian Association of Teachers of English. In June I went to the University of Namibia, School of Military Science in Windhoek to trial my new Military English coursebook. Twenty-four officers - in rank from captain to full colonel - took part in the training. The course was based on a new Military English course book: Military English for Tactical and Peacekeeping Operations. The areas covered in the course included describing position and terrain (mountains, deserts and tropical environments), the disposition of forces (using map symbols and grid references), medical English (including parts of the body, common medical problems and their treatment), the weather, land navigation, the phonetic alphabet, military movement formations, patrol briefings, and rules of engagement (ROE). During the course, the participants had to make joint and individual briefings and write reports on the disposition of forces. All the participants were fully engaged in the training and made significant progress in their language abilities. The Deputy Minister of Defence opened and closed the training. 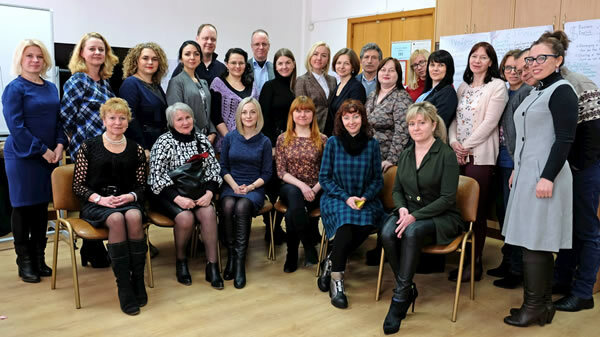 The British Council Ukraine organised a Certificate in Vocational English Language Teaching (CiVELT) course to a group of 25 teachers from institutions from around Belarus. The 35-hour intensive course took place at the Minsk State Linguistic University in the centre of Minsk. The course covered modules on ESP, professional profiles, needs analysis, creating positive classroom interactions, using authentic materials and evaluating coursebooks. The participants were extremely positive and enthusiastic about learning and developing their professional skills, and hopefully this course will mark the beginning of a period of sustained engagement for us in the Republic of Belarus. I visited Skopje for the British Embassy there to work with the Macedonian Testing Team on their STANAG speaking tests (in January), and to help moderate reading and listening test items for STANAG 2 and 3 (in March). The team worked very hard on revising the items and writing new types of items for their exams. The moderated items now need to be trialed before being used in live examinations. The final seminar for the PELT Project took place in Montenegro from the 20 to the 24th March. Mirjana Ivancev from Serbia and myself led a one-week Moodle materials development course to kick start Moodle courses for the Montenegrin Armed Forces. After the PELT Conference I returned to Macedonia for the final workshop of the project there. We spent the week looking at reading and listening tasks for STANAG and progress and achievement tests, and created a set of tasks at different levels. With the PELT Project closing at the end of March 2017, the PELT Board and British Council organized a Regional Conference with participants from Serbia, Montenegro, Macedonia and Bosnia and Herzegovina. Dr Claire Whittaker and myself organized and moderated the conference, which looked ahead to future regional co-operation and activities and drew up a roadmap of actions to be taken to ensure continued engagement on a regional and bilateral level. Mirjana Ivancev from Serbia and myself led a one-week Moodle materials development event with the teachers from the Centre for Foreign Languages, the Military Academy, and the STANAG 2001 Testing Team. The test team created a site on Moodle for test takers, including practice materials for the reading paper, while the teachers created further practice materials for their Level 3 language course. September found me once again in the western Balkans with a visit to Montenegro to work on Integrated Skills lessons with the MAF teachers. Then in October I went to Serbia to work on developing aspects of placement, progress and achievement tests with the Serbian teachers. I went on to visit Sarajevo on a fact-finding mission for a report into the possible regionalisation of the English language projects in the six countries of the western Balkans region - Albania, BiH, Kosovo, Macedonia, Montenegro and Serbia. Towards the end of October I briefly visited Kosovo and Macedonia for the report, which I delivered in early in November. 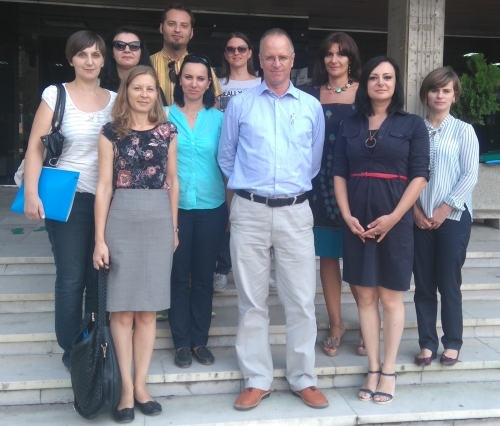 In late August ten teachers and testers from the Centre for Foreign Languages, the Military Academy and the STANAG Testing Team in Skopje, Macedonia attended a 5 day workshop on Speaking and Writing Testing. During the workshop the participants drafted, trialled and revised STANAG Speaking and Writing Ratings scales for Levels 1 - 3 [including plus levels]. Four candidates were interviewed, videotaped and evaluated in mock examinations. The new Writing Scales were trialled on sets of candidate scripts from STANAG test sessions. The format and contents of the STANAG Speaking and Writing examinations were discussed and suggestions for revisions were made. Speaking and Writing Achievement Test Rating Scales for Levels 1 - 5 at the Centre for Foreign Languages were also developed, trialled and revised. The writing and speaking achievement tests at the Centre for Foreign Languages were evaluated and suggestions made for improvements. The British Council, in conjunction with the Latvian Association of Teachers of English, organized a summer refresher course for teachers of English and teachers who teach subjects in English - CLIL teachers. I gave two sessions; one on the Deep Text and Dual Text approaches to reading and one on language. More information here. I returned to Montenegro in March to lead the MAF teachers in an intensive four days of materials development for reading and writing. The team created 25 units of reading lessons and four writing lessons. These are now ready for trialling. 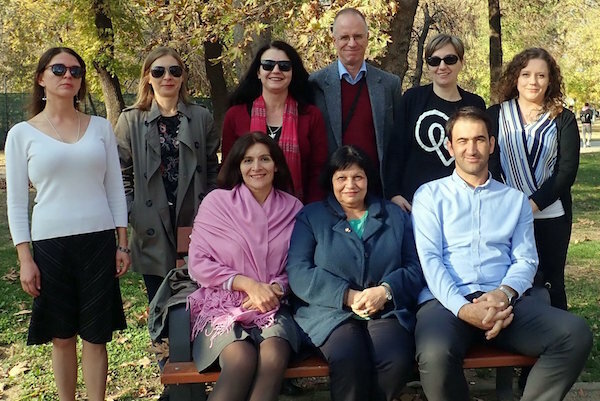 The Macedonian MOD has invested in a Moodle Virtual Learning Environment set up to enhance delivery of courses, including English language instruction. 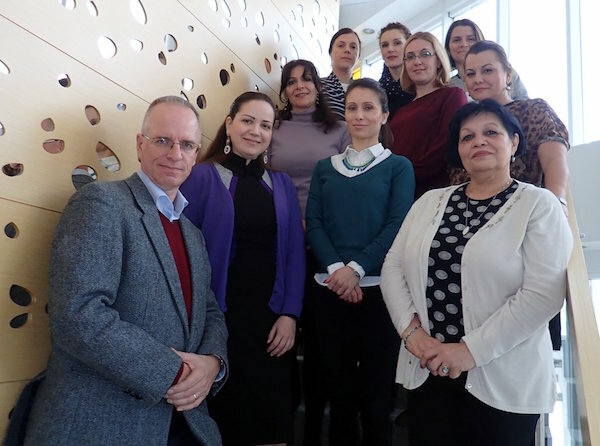 The British Council organized a three day Introduction to Moodle training for English teachers in Skopje (2nd to 4th March). Mirjana Ivancev, a PELT consultant from Serbia, and I, led the training of 10 teachers and testers. The topics covered included the pedagogy of online learning and practical hands-on experience of Moodle, in preparation for future course development. The Academy teachers are planning to upload supplementary materials onto Moodle as a first step to gain experience before developing longer courses.The Macedonian Testing Team are considering putting information about STANAG examinations and practice test materials on the Moodle platform. 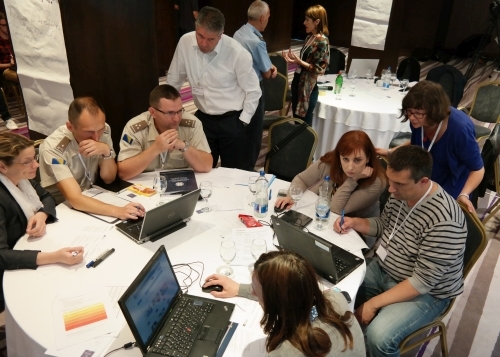 Two teachers from Montenegro also attended the event and reported back to their MOD on the potential for Moodle. Namibia sees it as essential that their military can contribute to peace support operations in Africa and throughout the world; to help achieve this the Namibian Defence Forces and the British Peace Support Team based in South Africa agreed a further course in the training of Namibian Defence Force personnel for peacekeeping and interoperability, to build on the work done last July in Windhoek. 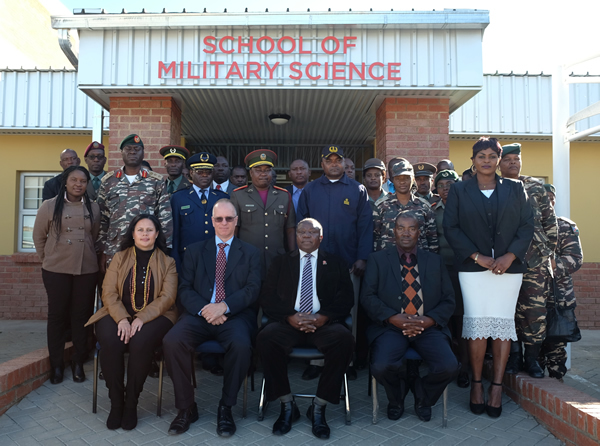 This course, the fourth English language training event for Namibian Defence Force personnel, was held from the 8th to 26th February 2016 at the University of Namibia Khomasdal campus. The three-week intensive course was delivered with Nick Fletcher. The course was designed to improve the English communication skills of NDF soldier for peacekeeping purposes and concentrated on communication skills such as giving briefings, radio communication skills [through realistic practice with walkie talkies], and report writing. The twenty-nine participants did a lot of briefings on humanitarian assistance operations and problem-based scenarios, and role-played running checkpoints and vehicle searches (outside in the car park) to develop the practical skills which might save their lives in future operations. 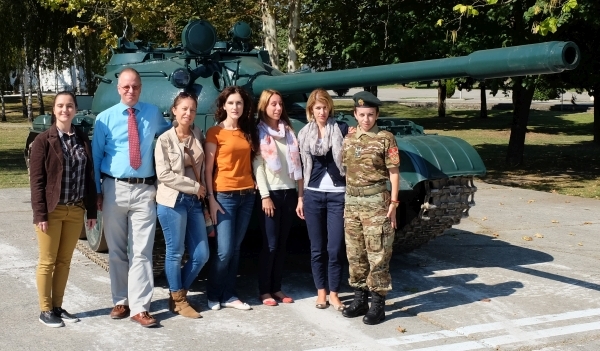 The Montenegrin Armed Forces and the British Council Montenegro identified a need for a short intensive course in Radio English for pre-deployment training and brought together nine teachers from Montenegro, Bosnia and Macedonia to create such a course. The teachers wrote and immediately trialled the course with a group of 14 soldiers, at the Danilovgrad base near Podgorica, over an intensive week of work. The result is a 20 hour course focused on revising and practicing Radio English. The course has a very straightforward methodology and could be taught by soldiers in places where teachers are not available. The course will available to be used in all three countries and will provide an essential component of pre-mission readiness training. At the end of July, 40 members of the Namibian Defence Forces gathered in Windhoek for English language training for peacekeeping operations. The training took two weeks and was facilitated by myself and Nick Fletcher. In the picture you can see participants explaining how vehicle checkpoints work. The first PELT Regional Conference was held in Belgrade on the 23rd and 24th June. 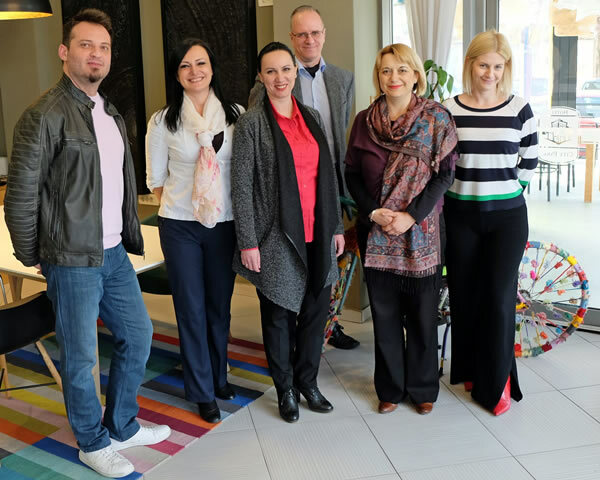 Participants from Serbia, Bosnia and Herzegovina, Montenegro and Macedonia gathered to discuss regional co-operation and how to widen the project throughout the region. In the picture you can see representatives drafting three year project plans. 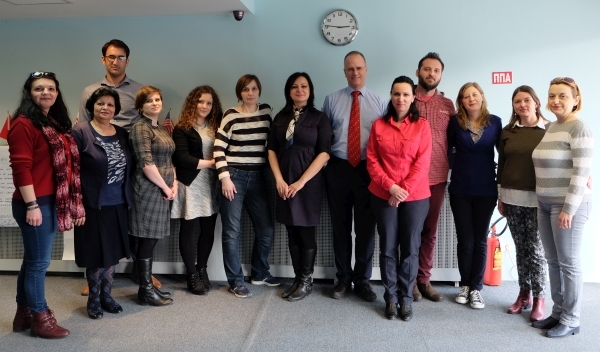 The PELT Seminar in March focused on developing the skills required by Military teachers in Serbia, Bosnia and Montenegro to develop high quality teaching materials based on listening texts. The twenty-three teachers who took part learned how to source, download, edit and convert video and audio files, and script and record audio. 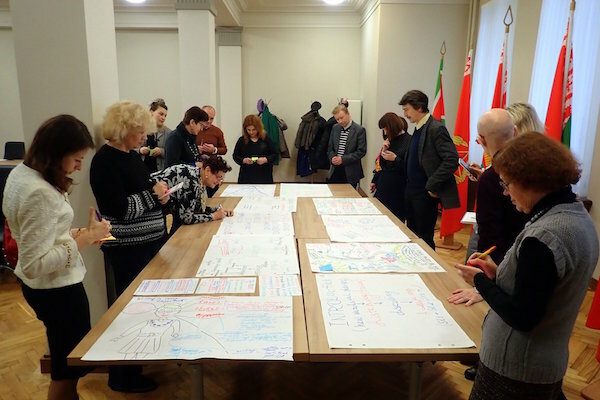 One team produced a set of general English and Military English paper-based lessons using a collaborative model of materials development, while the second team of Serbian teachers from J7 and the Military Academy worked on drafting listening materials for their Moodle courses. The materials were all peer-reviewed and trialled. The course was held in Ruma, a small town just outside Belgrade from the 9th to the 13th March. 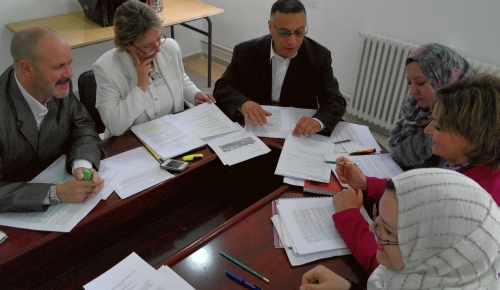 In November School Inspectors and Teacher Trainers in Algeria received training in materials development and training skills for the British Council and Algerian Ministry of Education. In Ouargla a small group of 24 teachers, who you can see in the picture above, were trained. In Algiers the group was larger: 68 teachers. Below, some of the Inspectors and Trainers are discussing the material they will create. McIlwraith Education are working with the Serbian and Montenegrin MoDs to improve the teaching of English in their institutions. Over the summer course writers worked on-line to create two Moodle-based Reading Skills courses. In March 17 participants took part in paper-based materials development and on-line course planning in the Tara mountains in Serbia. 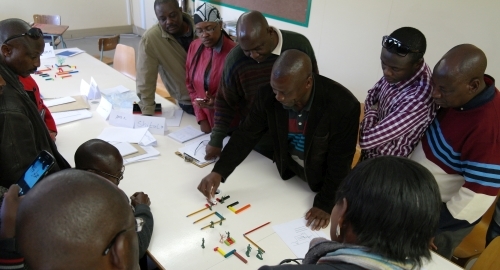 One group planned two on-line Moodle courses while the second group created a set of paper-based materials to supplement their courses which use Headway and Campaign. The materials will be available to the teachers in an on-line repository when they have been trialled and revised. In the photograph you can see teachers discussing the content of the on-line courses. In February we did a Moodle course called On-line Learning written for Serbian military English teachers. 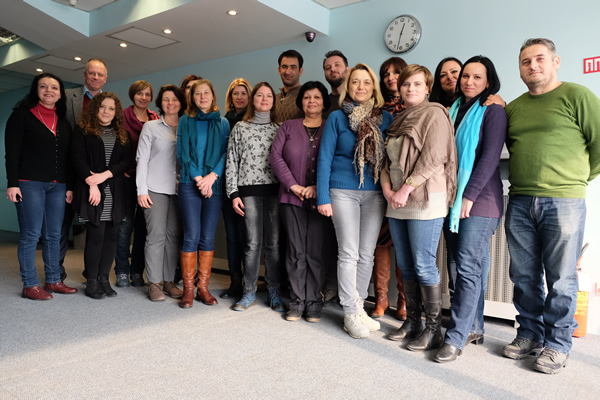 In January 2014 teachers from the MOD, the Institute for Foreign Languages and Double L language school in Montenegro had a seminar on developing teaching materials. In the 4 day seminar the teachers were introduced to the key ideas of material design and then we worked intensively on producing a set of materials to meet some of their needs. We created a variety of materials from simple Find Someone Whos to full lessons with recordings. In the picture on the right you can see three teachers recording conversations set in a restaurant. As we recorded in the base canteen there are authentic background noises, which make the tasks both more real and challenging to students. We produced 18 sets of materials and these will now be trialled by the teachers and revised. The approach we used was the 10-P Model which I developed in Estonia during my work with the Peacekeeping English project. In 2004 I created on-line learning materials for police officers using the Open Space Virtual Learning Environment and more recently, in autumn 2005, I created web-based materials using the Author Plus Online system and tested the effectiveness of these against face-to-face teaching. Materials writing training and workshops focused on developing quality materials quickly. I developed a criminal justice system corpus of one and a half million words and analyzed this to produce a key word list which specifies which words police officers, at an upper-intermediate language level, should learn. In 2005 I ran a course for teachers from Poland, Lithuania and Estonia on how to film and edit digital media for use with their students. The teachers, who had no experience of shooting video films, successfully story boarded, filmed and edited two five minute films in three days. This was also a fantastic team-building exercise. I advised the managers of the Public Service Academy and Border Guard School on quality improvement of the language teaching at these institutions ranging from placement testing to recruitment to the use of the Common European Framework. While running the Justice and Home Affairs Peacekeeping English Project in Estonia I devised an innovative exit strategy to ensure the continuation of co-operation between the Estonian and Latvian police training institutions. These were: training teacher trainers, developing a critical friends relationship between the partner institutions and developing an on-going joint project - the web Police-Rescue dictionary. In my four years of working with the Peacekeeping English Project I did a lot of team building in different situations with a wide variety of teachers and managers from countries as far afield as Uzbekistan, Georgia and Armenia, Slovenia and Romania. In this personal project I wrote a book about the ELT verb and prepared these grammar worksheets to support the ideas in the book.